This time, let’s look at how praising God for all things affects our minds and our emotions. In Proverbs 23:7 in the KJV it states, “As a man thinks, so is he.” Both biblical and secular scholars have acknowledged the power of our thoughts and the effects they wield on both our bodies and emotions. Scientists have proven that we can calm or increase our heart rate by the scenes we visualize mentally. Everyone is aware of the damaging effects of stress – the tension that builds when we feel overwhelmed, worry about things beyond our control, or imagine horrible outcomes based on present circumstances. These scenarios deplete our energy, leave us feeling hopeless and eventually take us to despair and a depressed state. This is definitely a downward spiral. Many years ago I was challenged to track the thoughts that led me into depression or despair and I made an amazing discovery. In almost every case the thoughts that led to this state started out with the question, “What if…?” I would play out some horrible scenario that may happen as a result of a mistake I made or some circumstance I was worried about. That 1st “What if ..” led to a darker scenario which led to another “What if…” that literally dumped me into an emotional pit. Within a relatively short period of time I could go from mildly concerned to outright depressed; and it all started with an innocent “What if…?” I could feel the darkness closing in on me! What was I doing? I was MAGNIFYING the problem. The more I considered it, the bigger and more ominous it became until it seemed insurmountable. So I learned from this, and when I heard those words pop into my brain I determined to go down a different path of thinking. One day several years ago I was living hand to mouth basically and totally dependent on God for all my provision. I was in the process of building a business and one day after thinking I had hit a very major goal and turning point, everything appeared to crumble around me. Several people seemed to be backing out of their commitments and mentally I started the dark hole of “what ifs” in the negative direction. Before I knew it, by late that afternoon I was depressed. I was so ecstatic just a few days before, thanking God for helping me hit this major goal and shared my praise report with anyone who would listen. Now I didn’t dare call any friends for help as I was sinking into the mire of my own depressing thoughts, because I felt like it would make God look bad and me a fool! I already knew about the power of praise but I was so overwhelmed, it hadn’t even occurred to me to thank Him for any of it. I was in my car and feeling at the end of my rope when I turned on the radio and at that instant, I heard someone say “and they put the devil under their foot” and it was if a clap of thunder boomed within my car. Immediately, I realized that I was under attack! I had been lured into the snare of doubt and fear and “what ifs” and it had darkened my mind, depressed my emotions and stimulated a bunch of other negative thoughts. But God showed up in that one line on the radio and the hair stood up on the back of my neck as I realized I was in a battle! I wasn’t going to go down without a fight! I immediately sat up straight in my car, narrowed my eyes and went to war. In a loud and determined voice I started praising God for every detail of the current circumstances. I thanked Him that He allowed all of it to happen. I acknowledged that He was in control and none of this could even take place if it wasn’t designed to make me stronger. I thanked Him that He was going to bring great good out of whatever ended up happening and I totally trusted Him for that. I thanked him that people quit and backed out. I even praised Him for how I had fallen for the enemies lies and gone into victim mode. I thanked Him for every nuance of the experience I could think of. The atmosphere in my car changed instantly and now it was crackling with energy and power. The presence of God was real and electrifying. My emotions went from the pit to the heavens within moments, why? When you bring God, who is light, into your thinking, the darkness must flee. It’ like turning on a light in a darkened room. My emotions immediately followed my thoughts and my faith started to rise. This once again started the upward cycle. I challenge you this week to track some of your thoughts. When you find yourself “down”, examine the thoughts that brought you there. Notice how they affected your emotions, then turn to your loving Heavenly Father, the Creator of the Universe who breathes stars into existence and start thanking Him for His sovereignty and promise to work “even this” for good. I can’t wait to hear about your experiences…. In two simple words . . . it works! I don’t mean that in a self serving way as though when I praise God for all things, as it mandates in Ephesians 5:20, that it is like a magic wand that brings all kinds of blessings my way. But praising God for everything at all times works on every level for everything! Superlatives galore! Usually using words like all, never, always, everything, and at all times is NOT the truth. Yet, when it comes to thanking and praising God for all things, He has made His Word very clear on the matter. What do I mean by that? This is such a profound and important topic to our Christian faith, I want to break it down into three different areas. How operating in and living by God’s command to praise Him for everything at all times affects us in the areas of our spirit, mind/emotions and bodies/material world. For this blog post, let’s address the spirit (our personal, spiritual life). Then, I find that sincerely praising God starts to bubble up JOY from somewhere deep inside. Nehemiah stated that the joy of the Lord is our strength. (Nehemiah 8:10) When I start praising, I begin seeing new possible outcomes I hadn’t considered before. My vision is heightened and I’m getting the mile high view (which usually brings more PEACE). The joy turns into STRENGTH. This strength enables me to be obedient to the direction of the Holy Spirit in my life when He leads me out of my comfort zone. This can be very exciting and even though it is sometimes scary, I know it’s coming from Him, so my only responsibility is to take the NEXT step. The outcome is God’s responsibility. He has simply asked me to be joyful on the journey and trust Him. Understanding this makes it easy to continue praising Him no matter what happens. All of this gives me more HOPE, which builds more positive expectation, which increases my faith and the cycle repeats itself! For once, we can be on an upward spiral! In Rick Warren’s book, The Purpose Driven Life, he states the sign of a mature Christian is one who can be thankful amidst tragedy. This is only possible as we get to know God more personally. In Psalms 22:3 God states He inhabits the praises of His people,. He brings His Presence, Power, Light and Love right into the middle of whatever we thank Him for. That, my friends, becomes very personal! If you exercise this practice of praise, this spiritual discipline of thanking God for all things, consistently for a week, I believe it will powerfully impact your spiritual well-being. It certainly did mine. Experiment and share your stories with the rest of us. For anyone who posts a comment and does not have a copy of Prison to Praise by Merlin Carothers, I will send them a FREE copy. When I got done with the last blog, I decided to use the formula I prescribed and cleaned my desk in just two 15 minute segments! It felt so good. 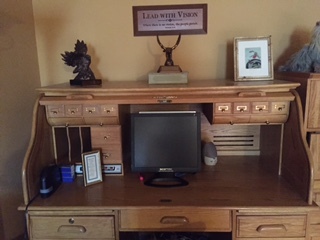 I still was surrounded by a pool table of papers, (where some of the papers from my desktop went), a roll top desk I no longer use regularly that has been the collection site for everything I wanted to get “out of sight” in a hurry when cleaning up for visitors. Isn’t that the purpose of a roll top anyway? In other words, I wasn’t done by a long shot. 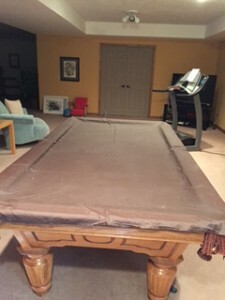 So in a couple days I decided to attack the pool table and get closer to the goal of a cleaned up basement. Why did I procrastinate another couple days? 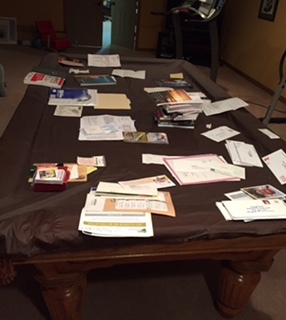 I learned that one of the reasons I put things off is I don’t want to make all the decisions that come with dealing with papers and “stuff”. “Do I file or throw away? What if I need this in the future?” etc. Subconsciously these were stumbling blocks for me. 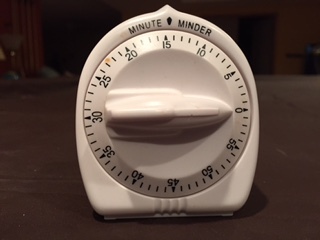 When I finally decided to “go for it”, I set my trusty timer for 15 minutes and voila! That’s all it took to clean up a mess I had been tolerating (and that was bugging me every time I came into the basement) for a month! I couldn’t believe it. I thought of a couple of questions that helped me with the first two I “feared”. “Is the cost of replacement of this item so high I need to keep it ‘just in case’? Will it be outdated and useless in a year from now anyway?” That really helped me get rid of some things. Next I confronted the roll top – more decisions, easier this time. It took 30 minutes to do it but knowing it’s clean under that top was like getting rid of a “boogy man” in my life! I no longer fear something jumping out to bite me or fall on my foot when I open it!